These two are visible on your scholar profile now, at least I can see them. As to digging the relationship between researchers, finding the superstar researchers and the citation and other info of a paper, I think Microsoft Academic does better. Both the papers will appear once they appear on IEEE and ACM websites. Google will consider all papers on these websites irrespective of file sizes etc. 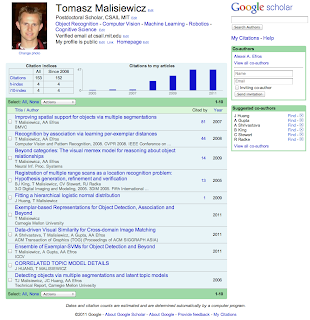 @visionfans I personally prefer Google Scholar over Microsoft Academic, although I agree that Microsoft has also done a great job with their system. @Anonymous Since I posted this blog post, my SIGGRAPH ASIA paper has popped up, but I'm still waiting for my ICCV paper to be indexed by Google. Clearly, file size limit is not the problem. However, I'm not sure what happens to papers that won't show up on IEEE/ACM websites.